My favorite camping place in Queensland was Mountain View Lake Holiday Park between Ayr en Townsville. Over one week of our four weeks holiday in Queensland we spent here watching birds and photographing spiders. As the bird watcher of our group told me while I had to stroll all day finding spiders was: This the best spot I have ever been. And you do not have to walk. Just sitting in your chair, waiting for the birds to come, identifying them from the field guide and waiting for the next one. For the spider hunters this place also is special. We found over 40 different species on this camping site. If you visit the place give our greeting to Fred Zabel who gave us a wonderful bushwalk and a pleasant stay. The stunning natural beauty of Mount Elliott and its surrounding Bowling Green Bay National Park provides the setting for the northern gateway to the Burdekin District. Nestled amongst this mountainous rainforest area is Mountain View Lake Holiday Park. Situated 45 kilometers north of Ayr, it provides an idyllic setting for camping and water skiing. 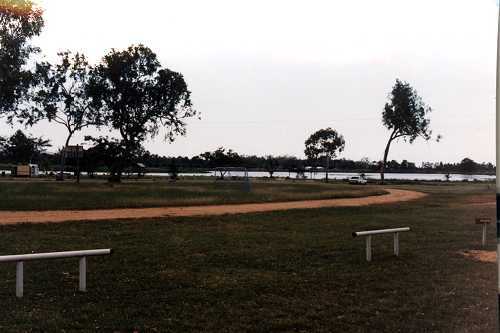 The park provides large campsite areas with full amenities and a lake for all water sports, which can also he hired for water ski groups with their own boats. The lake covers an area of 23 acres and depends on water from the wet season run off from the Mount Elliott ranges. An area of the lake has been designated for year round swimming. For those who prefer to stay on dry land, Mountain View Lake has acres of ground on which there are sports fields, consisting of a junior soccer field, volleyball court and a basketball hoop. Several schools from Townsville and the Burdekin district have already taken advantage of the ideal location and facilities to hold school camps. At this stage, there are some powered van sites and on site vans available. Guided bushwalks to mountain streams, waterfalls and swimming holes in the surrounding national park are available. Bookings are essential for this activity. The holiday park is owned by Fred Zabel who has established the park with his two sons, Peter and Kevin. For more information contact the park on (077) 829122 or Peter at his residence on 829451 or Kevin at his residence on 82 9666.